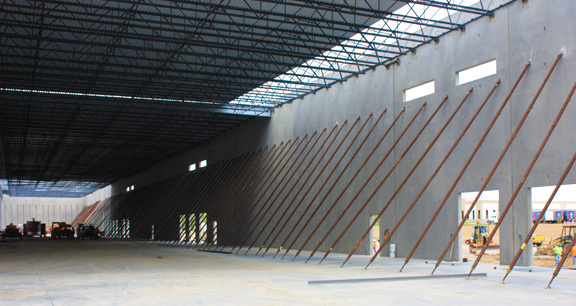 Project obstacles and solutions: In October 2015, J. Knipper and Company broke ground on a new high-volume distribution center in Charlestown, Indiana. The company was looking for a region that would serve its needs as a distributor of end-to-end samples management services for the pharmaceutical industry. The Charlestown location was selected due to its proximity to Louisville and the new I-265/East End Bridge project that has boosted warehousing and distribution in the area. AML served as the general contractor. AML and Broughton Concrete performed all of the concrete finishing work. The timeline on the construction of this facility was very tight. After breaking ground in October 2015, the facility was to be ready for turnkey operations in June 2016 - a mere eight months from start to finish. To speed up construction, the walls were constructed as tilt-up concrete panels. These were poured on site and set in place a few days after being poured. Most of the pours were performed in the dead of night during the coldest months of the year. IMI QC/QA was constantly monitoring ambient and ground temperatures during these pours. Curing had to accelerated in the coldest temperatures to be able to lift and set the walls on schedule. IMI supplied over 11,000 yards of concrete for this project. Despite weather delays, AML was able to complete the new distribution center on time. For more information on building with tilt-up concrete walls, contact the sales representative for the plant nearest your location. Click here.